This promising colt was the first foal of our superb producer Stonewall Fantasia, a daughter of the Knabstrupper stallion, Atlantis*, imported from Germany. Stonewall Fandango was the first of five consecutive full siblings from this cross, followed in 2010 by Stonewall Durango, 2011 by Stonewall Calypso, 2012 by Stonewall Samba and 2013 by Stonewall Minuet. In our Stonewall Sporthorse breeding program, we rarely keep colts as stallions, sell all the geldings and occasionally keep a favored filly to perform and work, then join our small broodmare band. Stonewall Fandango was sold as a two year old. We were delighted to see him go into the hands of the celebrated Danish Grand Prix rider Sandra Hansen. Sandra’s accomplished stable is called DenEquus based in San Juan Capistrano. Stonewall Fandango was started by us in harness and under saddle, but commenced his serious training as a three year old in the capable hands of Sandra Hansen. Sandra trains with the guidance of the former Olympic judge Axel Steiner, the revered German trainer Conrad Schumacher and others, to prepare her horses to succeed at the highest level(s) of competition.It has been exciting for us to follow Stonewall Fandango’s rapid ascent of the dressage ranks, from introductory and training levels, through first, second and third levels, to reach fourth level at the astonishing young age of seven in 2016. Fandango contines to perform with extraordinary consistency, trained and exhibited exclusively by Sandra Hansen. There is little doubt that Stonewall Fandango will soon reach the rarefied heights of Grand Prix performance. 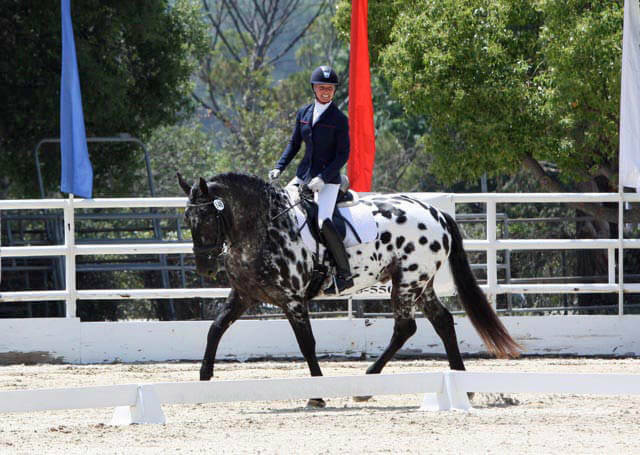 Fandango’s look-alike paternal half-brother Stonewall Marengo recently joined Sandra at DenEquus, also winning in his first outings in dressage on the challenging Southern California circuit. Together, these impressive young performers are leading the way for a new generation of Stonewall Sporthorses.